Oy Rebbe! Our Father, Our Friend! 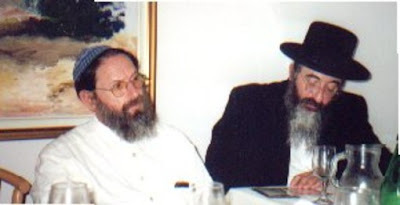 This Shabbos, Parshas B'Ha'aloscha will be the "Shabbos Yahrzeit" of the previous Modzitzer Rebbe, the Nachalas Dan, ztvk"l. Most everyone connected with Modzitz, as well as others who had a closer personal relationship with the Rebbe ztvk"l, will gather at the main Beis Medrash in Bnei Brak [20 Rechov Habakuk] for the Tefillos, Seudos and Tishim with the Rebbe Shlita. On the following Tuesday night, the beginning of the yahrzeit itself, the Rebbe Shlita will lead a Tish, right after Ma'ariv (which is at 8:30 pm). Wednesday will be a "Yom Shekulo Torah", starting from Shacharis at 8:00 am, with Shiurim [Torah lessons] throughout the morning and early afternoon. The Rebbe Shlita will give the main Shiur at 12:30 pm on the topic of "Esrog during the Shmita Year". At 3:30 pm, buses will leave Bnei Brak for Yerushalayim, where we will all go up to Har HaZeisim [Mount of Olives] to the Tziyun [gravesite] of the Nachalas Dan Ztvk"l at 4:45 pm. Mincha will follow at the Kosel at 5:30 pm. Join us in this memorable series of events, as we finish the painful year since the Rebbe Ztvk"l's passing, and use the opportunity to mark the directions of Modzitz's future growth. 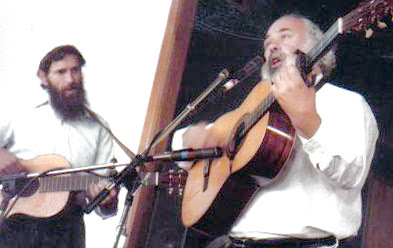 The first Israeli "Shlomo minyan" outside of Me'or Modiin was established in Efrat in 1993 by Dovid Zeller, who first heard Shlomo Carlebach sing at the Berkeley Film Festival in 1966. 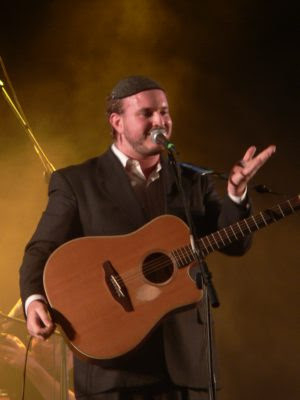 At the time, Zeller was into folk music, not Judaism, but eventually, after a long journey through Eastern philosophies, meditation and mysticism [see also next anecdote], he was ordained a rabbi by Carlebach. But the Efrat minyan (prayer group) was an exception, the lone wolf in an observant world that did not know how to be Shlomo without Shlomo actually being there. 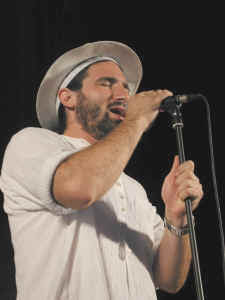 Zeller recalls how in early 1994, Carlebach came to Efrat for the Shabbat immediately following the fast day of the Tenth of Tevet. 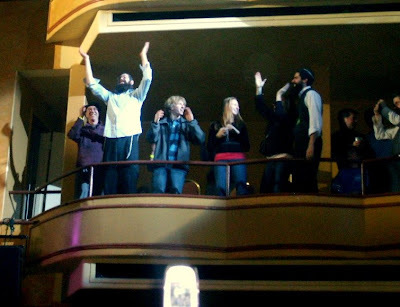 Although the town's rabbi, Steven Riskin, wanted to "nab" Shlomo to lead services in his own synagogue, Riskin's own worshippers demurred, claiming that Carlebach's singing would go on too long: they wanted to break their fasts as soon as possible. Rabbi Riskin approached several other synagogues in the town, but none were interested. Finally, Riskin was forced to concede defeat, and let the visitor pray at Zeller's "Shlomo minyan." Riskin, willing to extend his fast a while longer, sang and danced with Carlebach on what would be his last Shabbat in Efrat. He died later that year. P: Jewish people – very important for whole world. D: Huh? What’s that? Why are they so important??? P: Yeah, Jewish People – they responsible for whole world. D: Wow, really? Well, if there so important, why don’t you become Jewish then? P: ’Cause I don’t wanna be responsible for whole world. For whatever the reason is, the music that our generation is most exposed to is of a loud nature, a very loud nature. If we should aim for our music to be on the level of prayer, then something is a bit off. 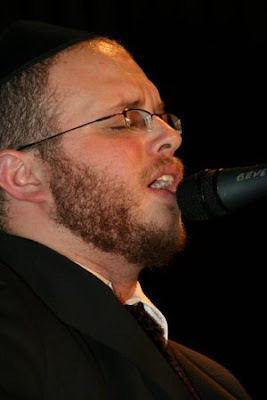 Our holy Master, Rebbe Nachman says, sometimes you need to sing and pray so loud, that no one can actually hear you. 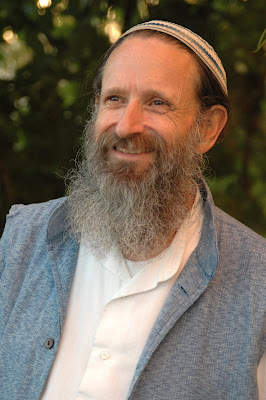 The one person, who I was blessed to know for many years, who captured the essence of Rebbe Nachman's teaching above, was Reb Dovid Zeller of blessed memory, who returned his neshama to the Creator this morning. Being a very deep and sweet singer/songwriter himself, Dovid would often talk to me about how he finds it hard to fit in to the music scene, since people just don't have the patience to listen anymore with their heart than with their ears. Birkat Kohanim, the bracha of all brachos, the blessing with which parents bless their children, is found in the midst of our parsha. As Hashem gives over to Moshe the nature of this awesome bracha , he tells him 'Emor Lahem'. We all know that 'Amira - Lashon Racha Hi', when it comes to the word 'amira', literally meaning 'saying', so it alludes to a gentle and soft manner of talking. Dibbur would be more the heavier component of speech. 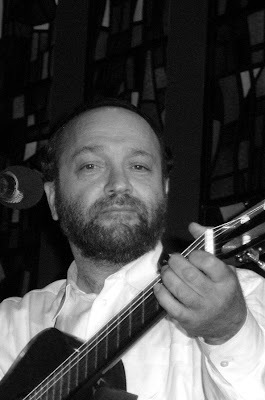 Brother Dovid, tonight, as you begin leading Kabbalas Shabbos with all the tzaddikim, all the soul masters you would so often learn and teach from, please know we are with you, davening next to you. And that whisper... that whisper was the greatest bracha you could have ever shared with all of us. May your angelic soul keep on piercing through ours. A Steep Climb Up…to the Kosel! My free translation of a story appearing in this week's "B'Sheva" newspaper. 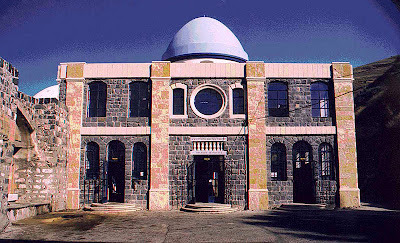 Dror liked to spend his time in the huge library in Dharamsala (northern India), which had just about every book written about every religion or cult in the world. During his many hours spent there, he would translate (into Hebrew) and summarize what he read into his notebook. He yearned to become a "master," one who wore the red cloak, who would spread the word of the Dali Lama throughout the world, especially to the Jewish People. One day, in a visit to the library, he came across a booklet, written in Hebrew, called "Masa" ("Journey," written by R. Erez Moshe Doron). He was infuriated: "I ran away from Jerusalem, and they’re chasing me even here to 'bring me back' to Judaism?!" In his fury he took the booklet out of the library and decided to burn it. Then he thought, "Hey, before I turn this 'missionary work' into ashes, let’s just see what’s written in it…"
He went into a restaurant, ordered something, and began to read a story by Rebbe Nachman of Breslov called, "A Story of a Teacher and his Student." This was the first time he found anything spiritual about Judaism. He read the entire story, not fully understanding it, but he clearly felt that, for the first time in his life, he had encountered the truth. The holy tongue [language], the powerful story, and the idea of a Tzaddik [righteous man] moved him deeply, and he began to cry. Only then did he realize how emotionally frozen he had become. The Tibetan spiritual methodology was based on sharpening the mind and nullifying the heart. The many books that he read here did not touch his soul, yet suddenly, a few lines in a small booklet brought him to tears…What’s happening here? He decided he must check this out thoroughly. During his stay in India, he meditated on many subjects. This time, he decided to do a focused meditation on one topic. If he finds it to be the Truth, he would follow it through completely, and if not, he would abandon it. He prepared his backpack with a month’s worth of provisions, and headed into the Himalayan Mountains, where he found an isolated place, at the edge of a forest, near some water which was flowing from an iceberg. After several exhausting fasts there, he continued his journey, but soon discovered that he had lost his way. Although he was an expert in navigation, he couldn’t figure out where he was. The melting snow and ice had erased the path. And although he was equipped with a map, its scale made it difficult to navigate. He continued a bit further, until he was completely lost. He arrived at a jungle, full of pits, where humans didn’t tread. On his way, he descended a steep hill of some 1200 meters [around 4000 feet! ], with the hope of finding a path below. As time passed, he increasingly felt that only a miracle could extricate him from the complex mess in which he found himself. As the sun was setting, Dror arrived at the bottom of the steep hill. But instead of a path, he found a raging river, whose torrential waters could split stones. There was no way to continue any further. A piece of wood that he tossed in soon became splinters, and he lost all hope of finding a path. His food supply was dwindling, and with his last bit of energy, he pitched a tent before nightfall. His grasp of nature was finished. All that he learned in the cult turned out to be false. Nothing was left in his soul except the decision that when he would return to Israel, he would check out Judaism. It was then that he remembered that his sister had told him that one who experiences a miracle has to make the "HaGomel" [thanksgiving] blessing, and he also remembered that there is a concept in Judaism called a neder [a vow], which one makes when in dire straits. From the depths of his heart, a prayer was uttered: "If You are indeed here, and if I come out of here alive, I will go to the Kosel [the Western Wall] to make the HaGomel blessing." He then fell asleep. In the morning, he awoke, renewed with hope. He remembered that when one is lost, he should retrace his steps, till he arrives at the point where he began to stray. Although it was crazy to ascend the steep incline that he had descended, he found new strength. Climbing to the top, he found a path leading to a flock of deer. Looking around, he discovered a promising sight – in the midst of the forest, some smoke was rising. Where there’s smoke, there’s fire; and where there’s fire, there’s a human. He headed off in the direction of the smoke, and in two days arrived at his destination. He found some locals who were herding cows in the forest. They gave him some bread and butter to eat, and showed him the way back. When he arrived in the city, he bought a plane ticket to Israel. Dror landed in Israel on Shavuos, before dawn. A year after he left, he surprised his parents and siblings in Jerusalem. His mother greeted him warmly, and then he woke his brother Yaniv up. "Let’s go to the Kosel, I have something to settle there," he said. Yaniv was shocked to find his brother leaning over his bed after a year’s absence, and even more so asking him to go with him to the Kosel. They set out on foot from their home to the Kosel. Upon their arrival, Dror asked someone in one of the many minyanim [prayer groups] if he could have help with saying the HaGomel blessing. The men were astonished by this request, coming from a young man with long hair and Indian style clothing. Nevertheless, someone gave him a kippa [skullcap], and showed him the blessing in the Siddur. Then they went through the Old City towards Jaffa Gate, where they encountered many more Jewish men, clad in tallises [prayer shawls], heading for the Kosel for the holiday prayers. He was suddenly overcome with a strong feeling towards them, and said to his brother, "Wow, how beautiful! What a privilege it is to be a Jew! For what do I need the red cloak? Is there anything more beautiful in the world than a Jew, clad in a white tallis, heading for the Kosel???" Chag Sameach to all! Have a Joyous Shavuos holiday! Hakaras HaTov - Thank you all! Again, I want to thank all of you who voted for me, as amazingly I came into a three-way tie for the JIB Award for Best Jewish Music Blog with two other wonderful music-oriented blogs, Ben Bresky's Israel Beat and Moshe Skier's Psycho Toddler. Thank you all so much! Here’s a video of the Modzitzer Rebbe Shlita, speaking in Hebrew on “Moshe Added One Day, on His Own,” which was recorded in the Beit El Yeshiva, before he became the Rebbe. The link takes you to a choice of either video or audio recording of this one-hour shiur [lesson]. 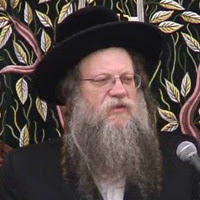 A 5-1/2-minute Erev Shavuos message, on video by the Melitzer Rebbe Shlita, has just been posted to Lazer Brody’s weblog, Lazer Beams. 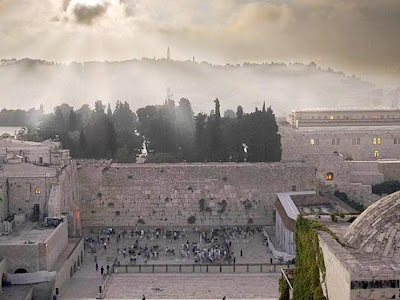 In honor of Yom Yerushalayim (Jerusalem Day), I am privileged to present an excerpt from the virtual pen [keyboard] of a good friend, Moshe Kempinski, who has a wonderful website called Shorashim (Gift Shop) and Shorashim Learning Center. Everything changed in a flash of Divine intervention. "You turned my mourning into dancing for me; You loosened my sackcloth, and girded me with gladness" (Tehillim 30:12). It was then that I heard the recording that shifted the world and changed my life. Then the microphones pick up the following voices. Amidst intermittent bullet fire one hears General Uzi Narkiss asking breathlessly, "Tell me, where is the Western Wall? How do we get there?" Israeli radio correspondent Yossi Ronen continues with following hesitant and breathless words, "I’m walking right now down the steps towards the Western Wall. I’m not a religious man, I never have been, but this is the Western Wall and I’m touching the stones of the Western Wall," and his voice trails off into a silence of awe. A loud and tearful "Amen" is heard. Shots continue to be fired and soldiers continue to weep as Rabbi Shlomo Goren blows the shofar he has brought with him with mighty and crystal clear sounds. He then ends with the declaration, "L’Shana HAZOT b’Yerushalayim hab’nuya, b’Yerushalayim HaAtika! This year in a rebuilt Jerusalem! In the Jerusalem of Old!" That shofar sound was the most dramatic thing I had ever heard in my young life at that point and I felt that call in every fiber of my body. I felt the earth and everything I had known shift underneath me and suddenly things were crystal clear and pure. The shofar began a melody in my soul that would not allow itself to be quelled. I knew then like I hadn't really known anything before that time, that I would, one day be able to call myself a Jerusalemite. Nothing was clearer and nothing was more imperative. It took too many years but I fulfilled the beginning of my vow (the rest of the vow included being able to dance with all my family in the Temple courtyards). The melody of that shofar blasts resonates in my soul every day I walk into the Old City of Jerusalem. It is that melody that seems to anchor my soul in the vision of what could be, what will be and what has already begun to be. Without that melody I fear I too would be drawn into the dark gloom of what hasn't yet come into being. It is so easy to see the cracks and the fissures of the Divinely-inspired edifice that is being constructed brick by brick in our days. Only with that melody resonating in one's soul one can step back and see the splendor of that which is being formed in our lifetime. It is so tempting to decry and bemoan the fact that the builders of this edifice are not imbued with the awe and the vision of what is being constructed. Yet with that melody in one's heart one begins to see that regardless of the blindness of the builders they continue to build. More importantly, when they tire and become an obstacle, others with clearer vision take their place. It is only with that melody that one can withstand the misguided and evil intentions of those who are too deaf to hear and as a result place obstacle after obstacle before the path of redemption, abusing, imprisoning and expelling those on the very path. 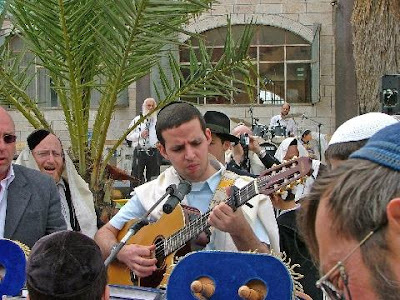 It is also a melody that gives one the strength to ignore the derision of all those whose spiritual Torah connection should have given them the ability to dance with the music but a long history of exile and persecution has made them unable to recognize the very melody they have been waiting to hear. It is that melody that animated and led the dancing man I witnessed several years ago in the main square in the Old City of Jerusalem. In preparation for the tens of thousands of people who were going to be dancing through all the gates of the Old City on Jerusalem Day, a music and record company had set up a booth outside of our shop. Their speakers were playing Jewish Chassidic music throughout that whole Jerusalem Day. Early in the day I saw an older man walking across the square and stop when he heard the music. He turned to two strangers who were walking in the same direction, grabbed their hands and started dancing with them. They danced but soon left him, yet he continued to dance alone. Very quickly several other people joined him in a circle. When they eventually left he continued to dance on his own until he was joined by others. When one disc had ended and there was a pause before the next music disc was put on, he still continued to dance. It was obvious that the melody he heard was not coming from the speakers. A group of young secular children walked by and smiled at the dancing man. He beckoned to them to join him and they hesitated. They did not hesitate for long as they probably saw the melody burning in his eyes and another circle began to form. Within minutes a group of young soldiers joined in and the circles became larger and one circle formed within another one. The dancing man continued to sway and dance in the middle. Everybody he touched or danced with him left the encounter a little bit changed. Even those who did not join but preferred to watch or dance from a distance heard the very same melody that had captured this dancing man's soul. It was a melody exuding from every move of his feet and sway of his upturned arms. The dancing man continued alone or in circles with others for a very long time. Finally, when the first wave of marchers came through the Jewish Quarter on their way to the Western Wall, he was swept up with them, lost in the flowing blue and white flags. I followed him for a part of the way until he became enveloped by the growing joyful crowd. Yet he never stopped dancing. 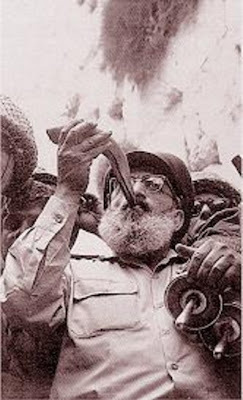 The melody that began in the mighty blast of the Shofar at Mount Sinai and that I heard from the shofar of Rabbi Goren forty years ago and that ran through the soul of this dancing man was the very "song of Hashem." As the Psalmist writes in Tehillim 137: "How shall we sing the L-rd's song (the song of Hashem) in a strange land? If I forget you, O Jerusalem, let my right hand lose its strength. If I do not remember you, let my tongue cleave to the roof of my mouth; if I don't prefer Jerusalem over and above my chief joy." Those that hear the melody will continue to withstand the abuse and obstacles raised by those that are deaf to the melody. Those that dance to the melody will continue ignore the ridicule of those that after so many years of exile have forgotten how to recognize the melody that even they themselves hear it. On this Jerusalem Day we will be singing the song of Hashem in that "City that has been reunited" (Tehillim 122:3), and we will dance to that melody even though we are very aware that the dance has just begun. Yom Yerushalayim Sameach - May we soon see Yerushalayim completely rebuilt, with the Beis HaMikdash (Holy Temple)! In January, Batya of Shiloh Musings posted a piece called, "It was beautiful, it was thrilling, but is it dovening?" Although I empathized with her and even left a comment there, I somehow felt that this couldn’t happen to me. Well, I was wrong. This past Shabbos, one of the "big names" on the Chazanus scene was to be making his appearance at one of the shuls in my neighborhood. I had seen this man at some Chazanus concerts, and enjoyed his talents immensely. Being a mere five-minute walk away, and being that it was Shabbos M’varchin [when we bless the upcoming new Jewish month], I figured, why not try it? Many of my friends were planning to go as well, and indeed when I arrived there this morning, a few minutes late, the shul was quite full. Pesukei d’Zimra, the opening part of the service, was usual [ordinary, but fine], led by a regular member of the shul. Then, for Shochen Ad, the chazan went up, accompanied by a choir of about ten men, with the full range of voices, from soprano to bass. Indeed, both the chazan and the choir sang beautifully. BUT, as Batya indeed expressed it, it was not a Tefilla, it was not davening – it was a performance. In fact, the congregation basically “mumbled” their prayers in a rushed way for about 30 to 60 seconds, before the next part of the performance came – a 10-minute interlude of the chazan and the choir performing the next piece from the Siddur [prayer book]. After this went on for quite a while, I realized that I was not davening, but anticipating "what would be the next piece they would perform." Once I caught that thought in my mind, I decided I had to leave. Looking at my watch, I decided I could go ahead of the "davening" through Shmoneh Esre, and then make it to my regular shul in time for Kriyas HaTorah [the Torah reading] and the rest of davening. But of course, I didn’t want to embarrass anyone, including myself, by davening Shmoneh Esre in a corner or the back of the shul. Fortunately for me, there was another minyan in a downstairs room of the same shul’s building, so I went there, intending to daven Shmoneh Esre by myself in the back. Again, a smile from Above descended upon me, as they were in the midst of Shmoneh Esre! When I finished that part, I made it over to my shul in time for Kriyas HaTorah. I guess I’ve learned my lesson – chazanim are performers, and while they may give wonderful concerts, if you want your davening to be davening – well, stick to the simple. But as I indicated in my comments on Batya’s post, for me at least, this is not the same as a Carlebach or Modzitz davening. There, even though there’s a lot of singing, the congregation is very involved in singing along. They’re not sitting silently in their seats, waiting for the next part of the performance. 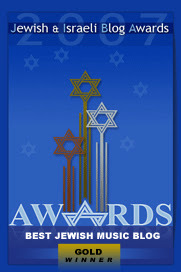 For those of you who are unaware, I'm a finalist for Best Jewish Music Blog. I would very much appreciate your vote, which you can cast by clicking here. Today, the 19th of Iyar, is the yahrzeit of Rebbe Menachem Mendel of Riminov, one of the pivotal figures in the Chassidic world. As a young man he studied Torah and Chassidus under the illustrious Rebbe Shmelke of Nikolsburg, and the Rebbe Reb Elimelech of Lizhensk, together with two of his friends - two other future Chassidic masters, the Chozeh of Lublin and the Maggid of Kozhnitz. It happened once that R. Menachem Mendel begged before G-d to help him attain a higher spiritual level, and in a dream, the Rif instructed him to go to Lizhensk to the Rebbe Reb Elimelech, where he would merit his spiritual desire [see, however, an alternative story below]. Among his disciples were such outstanding Chassidic leaders as Rebbe Naftali of Ropshitz and Rebbe Tzvi Elimelech of Dinov [the Bnei Yissaschar] and, of course, Rebbe Tzvi Hersh M’shareis of Riminov. Chassidim of the Rebbe Reb Elimelech were on their way to Lizhensk. They passed by a broken house in a village, where they saw a little boy of nine [years old] standing on a broken balcony and mamash [really] dancing like crazy. So they asked him, "Why are you dancing?" "I’m dancing because I haven't eaten in three days." "You haven't eaten in three days, and you’re dancing?" He said, "I'll tell you the truth, I was standing here, I'm nine years old, and I was so angry at G-d. Gevalt was I angry. I said, 'Master of the World, I’m only nine years old. How many aveiros, how many mistakes could I have made in my life? Do I deserve not to eat for three days?' Then suddenly I realized, it's true, G-d hasn't fed me yet for three days, but Baruch Hashem [thank G-d] I have a father, I have a mother, I have a brother and a sister. It’s true our house is not so big, and it's broken - but it’s still a little house. Suddenly it occurred to me - I never thank G-d for what I [do] have. So [that's why] I’m dancing!" The Chassidim walked in to (talk to) the parents and said, "Do you know what kind of son you have?? What kind of gevaldig neshama [lofty soul]? Are you sending him to cheder [school]?" They said, "We’re too poor to send him to cheder." The Chassidim said, “Such a great soul. Please let us take him to our Rebbe, Reb Elimelech." This boy eventually became the great Rebbe, Menachem Mendel of Riminov. Reb Shlomo continued: So I told this to our brothers in prison. "I’m sure you have many reasons to be angry at G-d, and I have no excuses for Him. I wish - I bless you to come out fast. But maybe in the meantime, let’s just dance and thank Him for what we have!!!" Zechuso yagein Aleinu - May the Riminover's merits protect us! 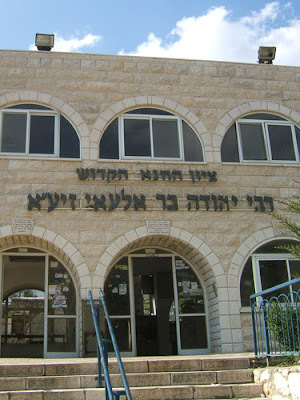 My wife is privileged to learn and tutor in a wonderful institute for women's learning in Yerushalayim called Nishmat. In honor of our "Lag b'Lag", our 33rd [!] wedding anniversary today, I am privileged to present a dvar Torah from one of the fine teachers at Nishmat, Rav Tzvi Leshem. On Lag B’Omer, the 33rd day between Pesach and Shavuot, weddings and haircuts are permitted, unlike during the rest of the Omer period, because the 24,000 students of Rebbe Akiva, who died from a plague due to internal dissent, ceased dying. 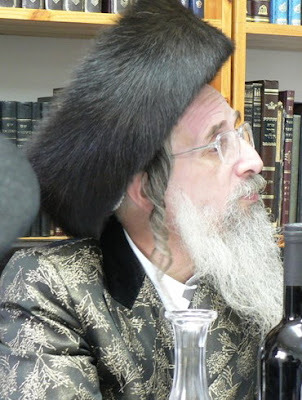 In addition Lag B’Omer is celebrated as the Hilula d’Rashbi, the yahrzeit of Rabbi Shimon bar Yochai (Rashbi), student of Rebbe Akiva and author of the Zohar, the foremost book of the Kabbalah. 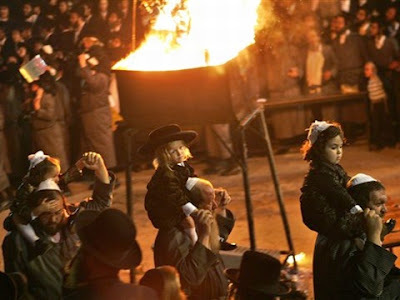 On this day, bonfires are lit throughout Israel, especially at Rabbi Shimon’s grave in Meron, little boys have their first haircuts, and a great celebration is held. According to the Bnei Yissaschar and Rav Tzadok HaKohen, Rashbi not only died on Lag B’Omer, but he was also born on the same day. It is quoted in the name of the Ari that Rebbe Akiva ordained Rashbi and his colleagues on Lag B’Omer, thus ensuring the continuity of the Oral Law after the death of his earlier students. The Gemara (Shabbat 33b) narrates how Rashbi and his son hid in a cave for twelve years after fleeing from the Roman decree of death. There, covered in sand, fed by a carob tree and drinking from a spring, the greatest secrets of the Torah were composed. Emerging from the cave, Rashbi perceived Jewish farmers working. Dismayed by their lack of Torah study, he "burned them up!" His shock is understandable in light of his position that Jews should only study Torah and not work. He is considered to be the only person whose Torah study is so great that he need not pray (although he did pray in the cave). Nonetheless, Rashbi and his son were ordered to return to the cave for another year, after which a mellower Rashbi emerged, whose love for every simple Jew was all too apparent. This too, writes the Aruch HaShulchan, was on Lag B’Omer. The Zohar relates how on the last day of his life, the sun stood still as Rashbi revealed the greatest secrets of the Torah. Dying happily, he encouraged his followers to make his yahrzeit a celebration. For this reason, the Ari, the Ohr HaChaim and other great Kabbalists would journey to Meron to celebrate on Lag B’Omer. We light bonfires, explains the Bnei Yissaschar, in honor of Rashbi, known as Botzina Kadisha, the Holy Candle, and in honor of the Zohar, the Book of Splendor. We also remember the great light of the day that the sun did not set, and mark the final stage of preparation for the giving of the Torah on Shavuot. On Lag B’Omer, seventeen days before the Torah is given, the light of the Torah begins to shine. 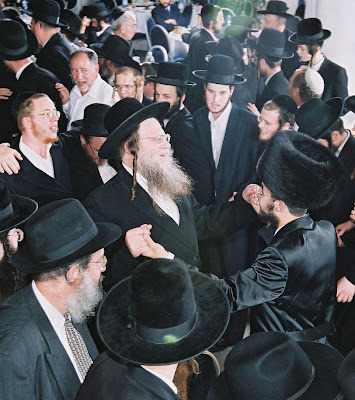 Rebbe Baruch of Medzibuzh would finish studying the Zohar on Lag B’Omer, and in his Beit Midrash everyone would dance hakafot for the Simchas Torah of Kabbalah. 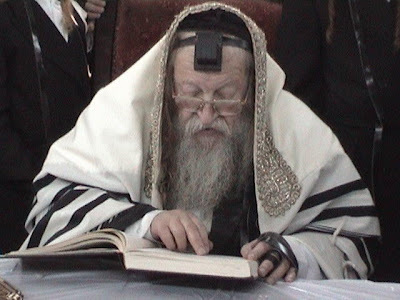 (It is told that the Rebbe Reb Baruch would hold a sefer HaZohar and lovingly cling to it and dance with it, as he would have held a sefer Torah on Simchas Torah – yitz). Rav Tzadok tells us that in the same way that the Rashbi continued the Oral Law of Rabbi Akiva, who was himself killed by the Romans, Lag B’Omer is a day when every Jew has the great potential for internalizing the Oral Law in all its manifestations. The reason for haircuts (as well as the ancient Sephardic custom of burning garments) may therefore be to symbolize our desire to throw off externalities (chitzoniyut) and become connected with the deeper reality (pnimiyut) that Rashbi teaches. By appreciating the holiness of Lag B’Omer and internalizing Rashbi’s message, we will merit that Hashem’s statutes will be engraved upon our hearts. It is interesting to note that the story of Rashbi appears on the 33rd page of Tractate Shabbat, as his life is so bound up with the 33rd day of the Omer. Excerpted from Rav Leshem’s book, Redemptions: Contemporary Chassidic Essays on the Parsha and the Festivals. Another connection: The Midrash says that the Jews took a month's supply of matza with them from Egypt, and when it was finished [on Pesach Sheni], they went for three days without bread. From this we learn, says the Chasam Sofer, that the mon [manna] fell on Lag B'Omer! From this Rebbe Yaakov of Husyatin says that it is a day to pray for material and spiritual things, because this is the day the mon started to fall, opening up a pipe of parnasa, not just for that generation, but for all generations after. Each and every year there is a renewal of the light of this great and holy day. More segulos and minhagim of this day can be found at Zchus Avos. Here's a nice video of Lag B’Omer in Meron. V'amartem Ko L'Chai - Rabbi Shimon bar Yochai! This Shabbos is the 17th [Tov] of Iyar, and the 32nd [Lev] Day of the Omer. The Hebrew words in brackets have the gematria – numerical value – of the numbers before them; thus today has a connection to "Lev Tov," a good heart. The significance of this can be found in the sefer Bnei Yissaschar on Lag B’Omer. Our good friend, A Simple Jew traces his ancestry back to the town of Sudylkov, and hence has become increasingly close to the Degel’s teachings. His posting last year was about Netzach of Hod and its relation to the Yahrzeit. Other interesting posts include a previous year’s post on the yahrzeit, a Photo Essay on the Degel, and a quote – from the Degel – about Am Segula. Finally, there are beautiful pictures of the Shtetl of Sudylkov scattered throughout his blog, or you can find them here; while a photo essay of the Shul is here. And of course, this year's post, Lego Castles & the Yahrzeit of the Degel Machaneh Ephraim, is here. I find it amazing that these two stories also seem to reflect the simplicity of the Degel, ASJ's Rebbe. I've translated them from the sefer "Mkor Ephraim," which appears in many editions of the sefer Degel Machaneh Ephraim. Although the Degel spent time under the Maggid of Mezritch and Rebbe Yaakov Yosef of Polnoye [the Toldos] after the Baal Shem Tov’s passing, he would visit his grandfather’s grave in Medzibuzh each year before Shavuos, his grandfather’s yahrzeit. At the same time, he would utilize the opportunity to visit his brother, Baruch, who was the Rebbe of Medzibuzh. One year, he came to Medzibuzh, stopped at the kever, and returned to Sudylkov (where he was the Rav) without seeing his brother. After Shavuos, he returned to the gravesite, and only afterwards did he visit his brother. "What can I tell you, dear brother? Grandfather helped me, and I received the Torah just like at Mount Sinai--with thunder and lightning, with trembling and sweat, until I could no longer bear it. Just now, I went to the kever to ask him that this madreiga [attainment, level] be taken away from me, for I had lost almost my strength. Now that I returned it to grandfather, we are brothers as before." Rebbe Moshe Charm Ephraim’s impoverished lifestyle contrasted sharply with that of his brother, the Rebbe Reb Baruch of Medzibuzh, who had a "king’s table." Rebbe Baruch once came to Sudylkov spend a Shabbos with his brother. Aware of his brother's extravagance, Rebbe Moshe Chaim Ephraim told the members of his household to make the fanciest Shabbos possible. 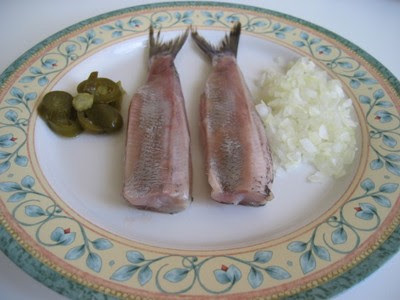 When the brothers arrived home after the Shabbos davening [prayers], the table was set: with two small wax candles flickering in clay candlesticks, a simple linen tablecloth, two small challos, glass cups, wooden plates, and herring with onions to eat. After making Kiddush and HaMotzi, Rebbe Baruch could no longer restrain himself. ''Brother Ephraim, how can I see you live like this? How can you live such an impoverished existence?" "Is there anything lacking in my house?" retorted his brother. "But where do you get the money for all those things?'' asked Rebbe Moshe Chaim Ephraim. "I travel around Volhynia and Podolia, guiding the Jews in avodas Hashem and the ways of Chassidus, and they support me generously." "Ah," said the Degel. "You see, my situation is really better than yours. While it’s true that you have silver and gold in your home, you yourself are not at home, but are wandering about in galus [exile]. But my lot is a fortunate one, for although the silver and gold are in galus and not in my home, I myself am always at home and close to my family." Zechuso yagein Aleinu v'al Kol Yisrael - May the Degel's merits protect us all! Today is the 14th of Iyar, Pesach Sheini, and the yahrzeit of two veritable giants of the Mishna – Rabbi Meir and Rabbi Yehuda. And as we mentioned last year, we have begun, in our counting of the Omer, the Sefira of Hod. The Zohar says that during this week, the "gates are open." Many Chassidim don't say Tachanun this entire week! Many of us know that a "stam" Mishna, a Mishna without the name of its author, is that of Rabbi Meir. And while we know that he is called Rabbi Meir Baal HaNess (“the Master of the Miracle”), do we know why? Rabbi Meir was married to Bruria, the daughter of Rabbi Chanina ben Tradyon, one of the ten martyrs. The government ordered Rabbi Chanina and his wife executed for teaching Torah publicly. They decreed that his daughter - Bruria's sister - should live a life of shame. She was placed in a brothel. Bruria asked her husband to save her sister. Rabbi Meir took a bag of gold coins and said to himself, "If she has remained chaste, a miracle will occur for her, and if not, there won’t be a miracle." He then went to the brothel disguised as a Roman horseman, and asked her to sleep with him. She refused, claiming she was in the midst of her menses. When he offered to wait until it was over, she said, "There are many other women here that are more beautiful than I." He then realized that she used this tactic whenever she was approached, and deemed that Bruria's sister had kept her chastity. Then he offered the gold coins as a bribe to the guard. The guard replied, "When my supervisor comes, he will notice one missing and kill me." Rabbi Meir answered, "Take half the money for yourself, and use the other half to bribe the officials." The guard continued, "And when there is no more money, and the supervisors come - then what will I do?" Rabbi Meir answered, "Say, 'The G-d of Meir - answer me!' and you will be saved." The guard asked, "And how can I be guaranteed that this will save me?" Rabbi Meir replied, "Look - there are man-eating dogs over there. I will go to them and you will see for yourself." Rabbi Meir walked over to the dogs, threw a clump of dirt at them, and they ran at him to tear him apart. He cried, "G-d of Meir - answer me!" and the dogs retreated. The guard was convinced, and he gave him the girl. When the group of supervisors came, the guard bribed them with the money. Eventually, the money was used up, and it was publicized what had happened. They arrested the guard and sentenced him to death by hanging. They tied the rope around his neck and he said, "G-d of Meir - answer me!" The rope tore, much to everyone’s amazement. He told them the incident, and they went after Rabbi Meir. The guard was saved. Others say he happened just then to see food cooked by goyim [heathens], and he dipped in one finger and then sucked the other. [He appeared to be eating it, even though he didn’t]. Others again say that Eliyahu HaNavi [Elijah the Prophet] appeared to them as a harlot who embraced him. "G-d forbid," they said, "if this was Rabbi Meir, he would not have acted like this!" [and they left him]. He then arose and ran away and came to Bavel [Babylon]. From then on, we have a tradition that when a Jew finds himself, Heaven forbid, in any sort of trouble or crisis, he should give charity, and dedicate it in the memory of Rabbi Meir Baal HaNess. He should then say simply the phrase, אלהא דמאיר ענני - "Eloka d'Meir aneini" - three times, which means, "G-d of Meir - answer me!" As mentioned above, today is also the yahrzeit of Rabbi Yehuda bar Ilai, who, along with Rabbi Meir was one of the five leading disciples of Rabbi Akiva after the death of his 24,000 talmidim during the Sefira period. Among other things, anyone who makes an "early Shabbos," owes it to Rabbi Yehuda. In the Mishna in Brachos [4:1], it is brought that Mincha, the afternoon prayer, may be said until "evening" [sunset]; Rabbi Yehuda, however, holds that it may only be said until "plag HaMincha" which is 1-1/4 Halachic hours before sunset. Although that is not the Halacha, we do rely on Rabbi Yehuda’s opinion to permit a person to daven Ma'ariv, the evening prayer, after "plag" – which is the basis for the "early Shabbos" minyanim. Rabbi Yehuda never dressed in the noble manner befitting a person of his stature. In fact, he didn't even own any warm clothing at all. One day his wife managed to purchase some inexpensive wool yarn. She spun it and wove it into cloth. From this material she fashioned a loose robe worn as a cloak. She even decorated it with beautiful embroidery to give it a finer appearance, as was fitting for her distinguished husband. Now, this type of garment was worn at that time by men and women alike, so Rabbi Yehuda and his wife shared it. When she needed to do errands in the marketplace she wore it; when Rabbi Yehuda went to the study hall he would wear the new cloak. He was, in fact, so pleased to own this warm coat that he composed a special blessing to be recited before putting it on: "Blessed is G-d who has enwrapped me in a cloak." Never mind that his coat was made of coarse homespun wool or that others had cloaks of far superior quality--Rabbi Yehuda was completely satisfied with his and never even noticed the others. Once Rabbi Shimon ben Gamliel declared a day of public fast and prayer because of a problem which beset the Jewish community. On such a day it was customary for all the Sages to gather together at the residence of the Nasi to pray as a group. This time, as well, they all came, with the exception of Rabbi Yehuda bar Ilai. It so happened that when the fast day was proclaimed, Rabbi Yehuda's wife was wearing the shared cape. Rabbi Yehuda, lacking a coat, was unable to join his colleagues. Rabbi Shimon ben Gamliel noted his absence with surprise, and questioned the other Sages to discover the reason he had failed to come. They explained to the Nasi that Rabbi Yehuda was unable to come because he had no coat to wear. When the Nasi heard this he was quick to dispatch a messenger to Rabbi Yehuda bearing a beautiful new cloak. When the messenger arrived, Rabbi Yehuda was seated on a mat on the floor engaged in the study of Torah. "The Nasi has sent this coat to the Rabbi as a gift," said the messenger. "He asks that Rabbi Yehuda wear it and come to pray with the other Sages." Rabbi Yehuda answered: "I have no need for a gift, as I already have a coat, thank G-d. My wife will return soon and bring it, and then I will come to the Nasi's house. I lack nothing; as you can see I am very wealthy." And with those words he lifted a corner of the mat on which he sat. There, sparkling like fire, were hundreds of gold dinars. The messenger was left speechless by the sight of such an enormous fortune. Rabbi Yehuda explained: "You see, I have enormous wealth if I want it, but I do not desire to benefit from this world any more than necessary." As he spoke, the golden coins disappeared, fulfilling his spoken desire. Rabbi Yehuda lived as always, in poverty. But he was satisfied with what he had, and he exemplified the words of the Sages [Pirkei Avos, 4:1]: "Who is a rich man. He who is happy with his lot." Zechusam Yagein Aleinu - May their merits protect us!